Spud got very excited watching the Olympic games last night, what a golden night it was. Mr Uphilldowndale and Tom are down on the beach in Weymouth watching all the sailing action on big screens and are having a very pleasant time by all accounts. Categories: Art, Devon, Dogs, Family, Sea, Spud, Spud on Sunday, Summer, Thoughts, Travel | Permalink. The magic of photography! Impossible otherwise…especially with Spud! 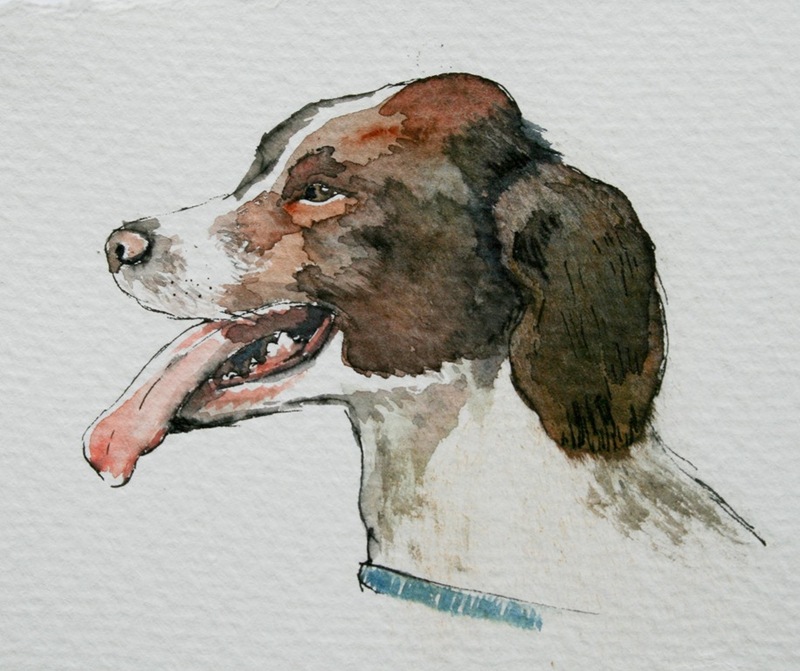 Love the portrait of Spud – handsome devil! Oh, she seems to have captured the twinkle in his eyes! Well done. Fantastic! I too wondered how Mrs Ogg got Spud to sit still! Of all the talents I envy, the ability to draw/paint is about the biggest. I have nothing but admiration for people who can translate what they see to paper or canvas. That’s a lovely painting of Spud. I can picture him spotting the tennis balls on the telly screen and getting very excited – our wee moggy was less than impresses with our “Good grief, the lad’s won it!” roar when Murray got his Gold. Lovely lovely. She’s captured the essence of a happy dog! Excellent portrait – and as a bonus, the Spud in there will stay neat and tidy for most of the afternoon while Spud In Real Life is out getting into the pond or rolling in something fragrant.